The HP Spectre x360 15 won PCWorld's Editor's Choice for its 2017 entrant, and it's gunning for another award with its 2018 update. 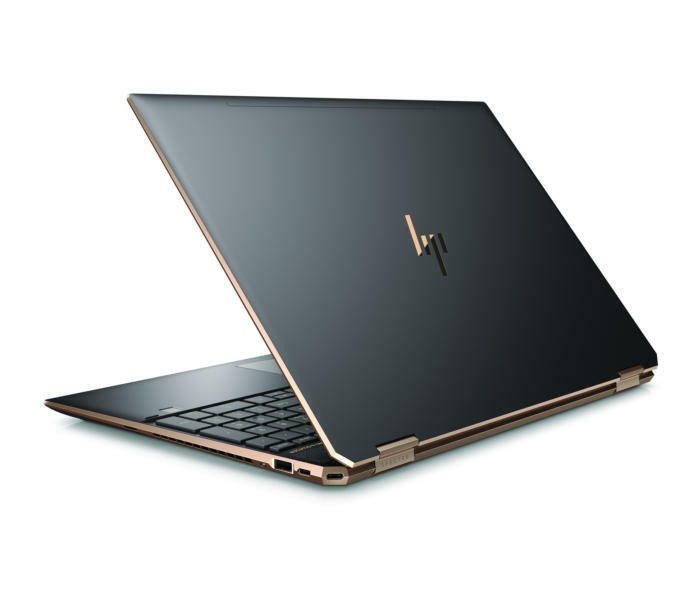 HP designed its 15-inch Spectre x360 notebook line with performance in mind, and the new HP Spectre x360 15 (2018) leaps ahead with optional six-core Intel “Coffee Lake H” processors inside, plus some design tweaks on the outside, too. HP’s Spectre x360 15 (2018) is the larger-scale relative of the the HP Spectre x360 13 (2018), with enough extra space to add a numeric keypad to the right of the keyboard. This generation debuts a chassis with faceted corners that house a USB-C port and the power button, plus a new webcam “kill switch.” It lacks the LTE support and whopping 22.5 hours of battery life of the smaller Spectre x360 13, but its "mere" 17.5 hours of battery life is still plenty. With the Spectre x360 15, HP is still providing quad-core 8th-gen Core parts, coupled with Nvidia GeForce MX150 graphics. A high-end version of the Spectre x360 15 will be available with six-core Coffee Lake-H chips, plus an Nvidia GeForce GTX 1050Ti GPU, with a starting price of $1,600. Remember the Radeon Vega M GPU used in the HP Spectre x360 15, an Editor’s Choice award-winner for 2017? Gone. All told, HP’s promising 20-percent-plus performance boost over the Spectre x360 15 (2017). As a convertible notebook, the HP Spectre x350 15 can flip back into tent mode. Dimensions: 14.22 x 9.84 x 0.76 inches (19.35 mm), 4.8 pounds—slightly thicker and heavier than the previous generation. HP’s Spectre x360 15 packs in the features and adds up the pounds. According to HP, the Spectre x360 15 weighed 4.02 pounds in 2016. The Spectre x360 15 (2017) weighed about 4.65 pounds and measured 16mm thin. The new 2018-2019 model weighs 4.8 pounds, and is 19.35mm thin—definitely a noticeable weight gain when I picked it up, though the added thickness is negligible. It’s a nice, sturdy platform, though, and the backlit keyboard (with 1.5mm key travel) felt pleasant to type upon. The new color options are visually arresting. 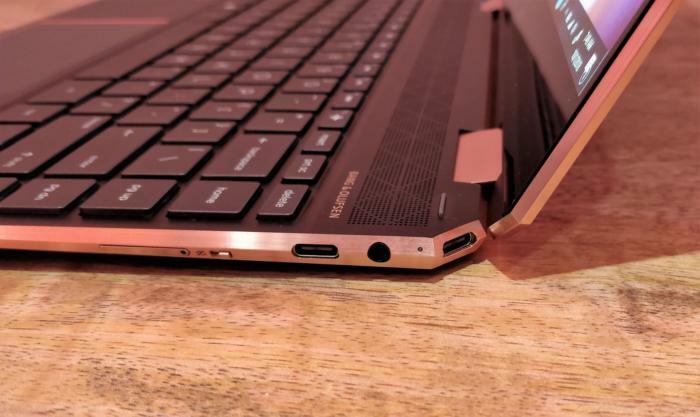 A look at the left side of the HP Spectre x360 15. 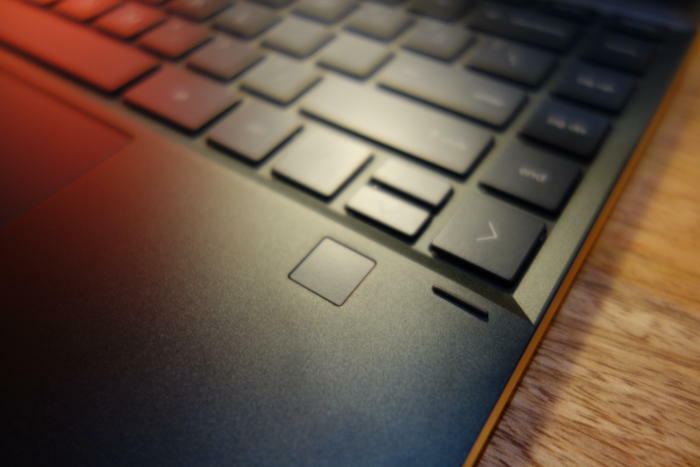 A microSD slot is tucked near the front of the laptop. 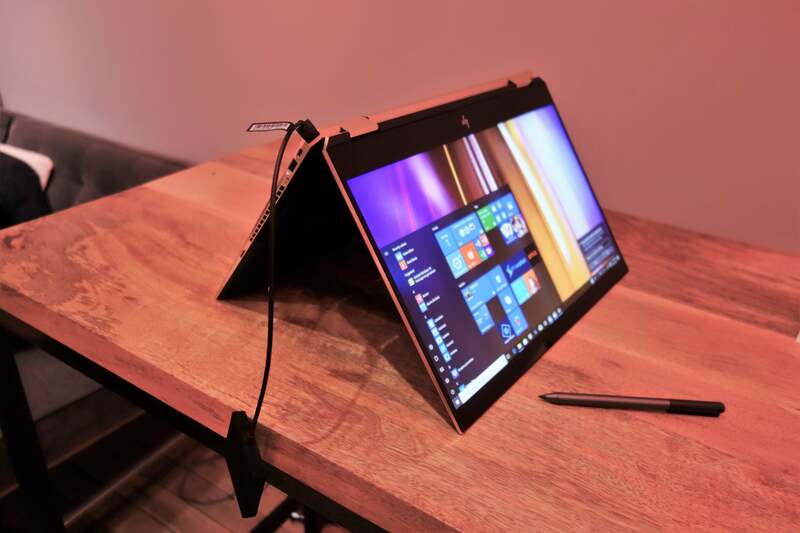 We had a chance to try out the new HP Spectre x360 15 (as well as its smaller sibling, the Spectre x360 13) at a recent HP showcase. Two new additions immediately stand out: the “faceted” corners, and the small privacy switch that disables the webcam. The idea, according to HP, is that the offset port will allow you to plug in a power cord without jamming it against the back of a desk or wall. While it may seem a bit gimmicky in concept, rear-mounted USB ports can be difficult to find without fumbling around. We’ll have to see how it works in the real world. Here’s the Thunderbolt-enabled USB-C port on the right-hand faceted corner of the Spectre x360 13, to give you a better look of how the corners look up close. A more interesting twist is webcam “kill switch” on the side of the Spectre x360 15. The Spectre’s webcam is mounted in its traditional location, at the top of the display, alongside the depth camera. But there’s no shutter or slide to assuage the fears of those worried about hackers spying on them without their knowledge. The HP Spectre x360 15 vents warm air out of the sides of the chassis. 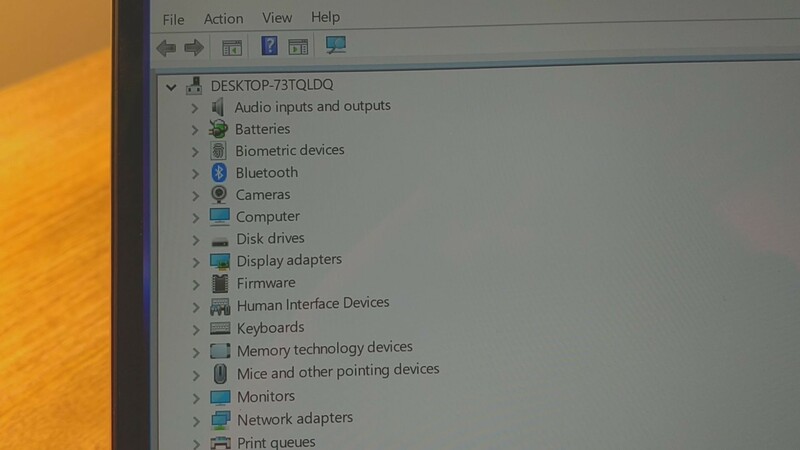 Instead, flipping the switch kills the electrical connection to the webcam, HP says—in fact, it disappears from the Windows Device Manager, as the video below shows. Is this enough security for the paranoid? My guess is no, not entirely. But it’s an ingenious approach to the problem. HP also removed the fingerprint scanner from the side of the Spectre x360 and moved it to a more conventional location on top of the palm rest. It feels like a more natural position. In both the HP Spectre x360 13 and 15, the fingerprint reader has been moved to the palm rest. Internally, HP’s promising better cooling for the Spectre x360 15, with bigger dual fans, dual radiators, an (internal) IR thermal sensor, and up to three heat pipes. HP also says that it’s added a new 3-phase fan motor for more consistent fan speed control. Unfortunately you can’t turn off the fan entirely. HP includes what it calls the “HP Command Center” utility to manage various thermal profiles. In the 13-inch version you can enable a “quiet mode” that minimizes the fan. With the 15-inch version, you can trigger both “cool” and “performance” modes to increase the fan and cool the device. HP’s display didn’t strike me as that unusual, though there are options to blast out up to 650 nits using select Sure View panels. That’s way more than the 260 or so we consider to be a comfortable viewing brightness, but it’s good news if you’ll want to use it outdoors. HP shrank the screen bezels by about 12 percent, though I doubt you’ll notice. The Spectre x360 15 will support an additional two 5K displays via the USB-C ports, HP says. HP’s promising the larger chassis of the Spectre x360 15 will hide quad speakers with a discrete amplifier. Bigger speaker boxes will create a bigger boom. Like other HP laptops and tablets, the audio is crafted by Bang & Olufsen. With the 2018 iteration of the Spectre x360 15 and 13, the speaker grille is larger, with a geometric pattern. 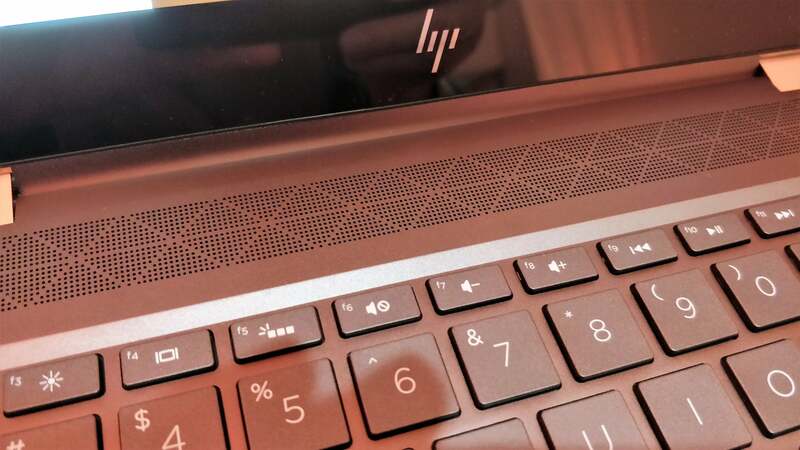 HP says you’ll be to hear the Bang & Olufsen speakers (four in the 15-inch model) more clearly. Performance, though, will be what differentiates the Spectre x360 15, in HP’s mind, and we weren’t able to test that. 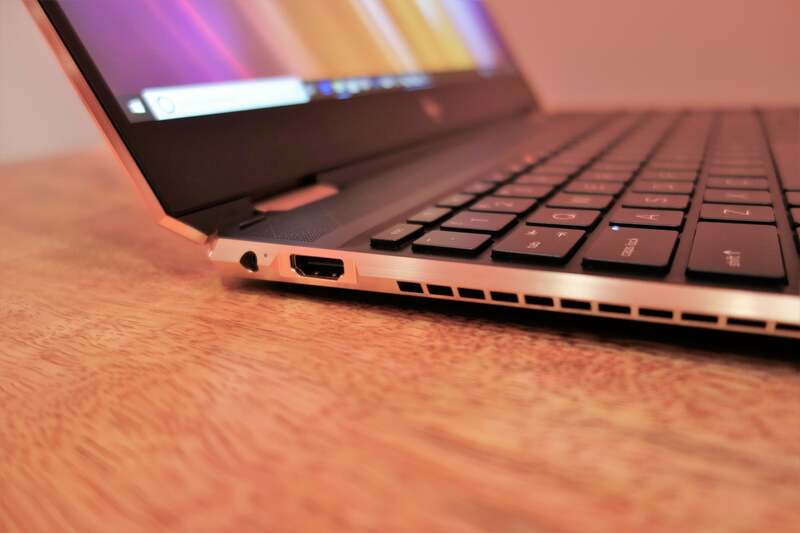 In addition to the new six-core Whiskey Lake processors, the HP Spectre x360s will boast new gigabit Wi-Fi provided by Intel—through you’ll see some benefit from that only if you also own a compatible router or access point. 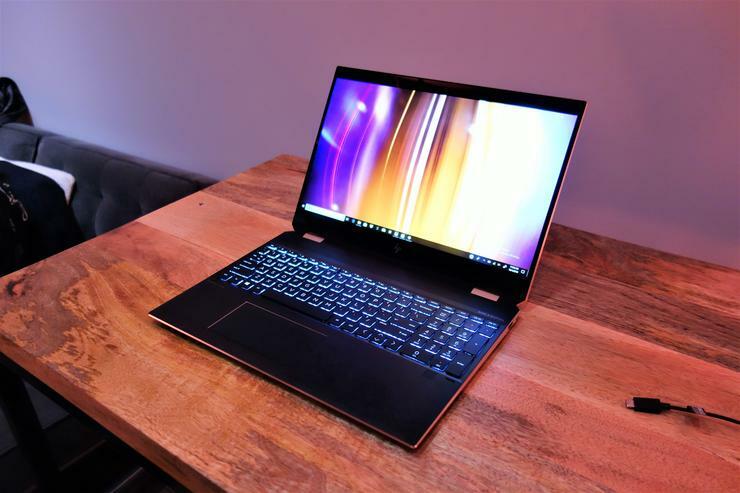 HP’s Spectre x360s seem to perpetually win our Editor’s Choice awards. Will the Spectre x360 15 do the same? On paper, its chances are good.